Steins;Gate wasn't as good as people said it was. Controversial way to begin this blog post, but I stand by that statement. Disclaimer: This is my opinion, and I'm entitled to it. You don't have to agree or disagree with it. While I was disappointed, I do think that Steins;Gate is one of the better series I've seen in the past year which says something, so don't take this as a OMG, HE THINKS STEINS;GATE IS THE WORST!!!! HE MUST DIE!!!!! It is a good series. I just feel it isn't as phenomenal as people make it out to be. The main reason I didn't enjoy this series as much probably has to do with other visual novel series I have seen over the years. To anyone who hasn't seen or watched any of these, you should probably stop reading here, partially for potential spoilers, partially because you will have absolutely no idea what I am talking about. 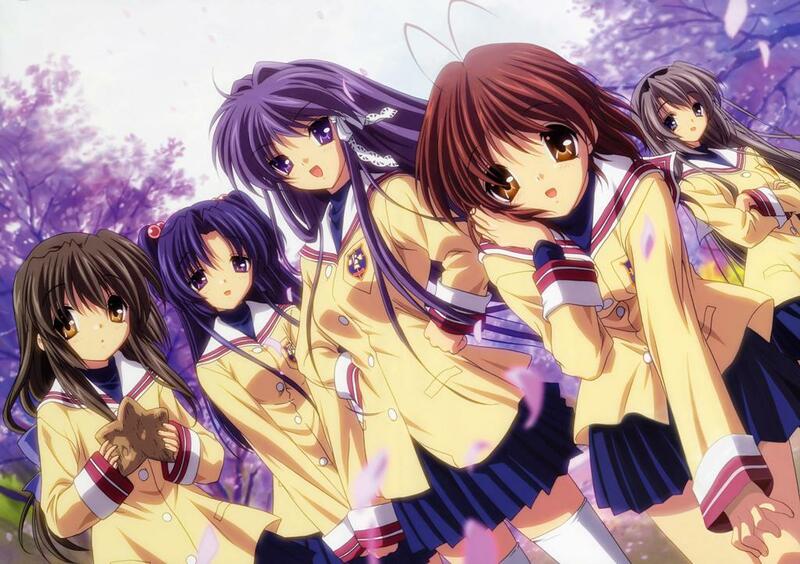 When I think of visual novel series, I, like most people, think of Key visual novel anime. They have brought us such classics like Air, Kanon, and Clannad. Whenever you talk about series based off of games, these are typically the ones that come to mind for most fans of anime. Kanon was the first one I watched and at the time, I thought it was a masterpiece. Since then I've been exposed to more series and tropes, and while I still think it is a pretty good series, I wouldn't go as far as to say it is a masterpiece. My feelings for these series, though, isn't what this article is about. After watching both Kanon and most of Clannad (I still can't watch it past the "everyone is depressed and dies saga. Yes, I know it turns out alright, but man...waaaaaay too much emotion going on there. ), I found that the series seem to be formulaic, meaning that the characters, plot setup, and feel of the series began to get predictable. Again with the eyes. Once you see it, you can't unsee it. Sadly, over time, this started to bleed over into other series as well. There have been some questionable series, like Happy Lesson, where after seeing a couple of episodes, I knew where this was going to go. 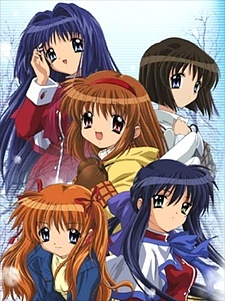 Ai Kora was also a bit ruined because each girl had a specific body part and eventually had her own storyline. Every time a series comes around that is harem-esque, I have to ask myself, "Is this a visual novel series?". I think I have this wiring in my brain that tried to logically figure out series before the episodes actually happen. Sometimes I would be surprised, sometimes it would end up ruining a series for me. Unfortunately, that happened to Steins;Gate for me. I greatly enjoyed the first half of the series. It had a great blend of science fiction, action, suspense, nerd humor, and conspiracy theory in it. Episode twelve, where the series was split up for American release, ended on a cliffhanger that had me wanting more. Sure, it wasn't the best I've ever seen, but for what it was, it was good. Eyes aren't as bad here. Man, I need to focus on something else. That's when it hit me. This sounded fairly close to Clannad, in a few ways. All the women seem to be connected to the time device, all were somehow affected by the messages...I began to wonder. Then I got the second half and while it was good, it sadly confirmed my fear. In order to get a good ending to the series, each of the original messages needed to be negated. How is this accomplished? Through each girl/confused male getting her/his own storyline!!!! Though the series tried to throw a few curve balls, I couldn't help but feel like this was, though not Key or a romance story, a visual novel series. It started off so good. A lot of excellent potential. In the end, it was thrown away to predictable storylines, plot, and sadly, a diminished experience for me. Again, the series is good, it just was more transparent with the plot device than I hoped. 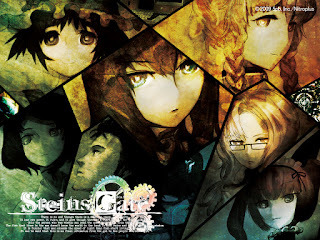 Yes, I know there are differences between Key series and Steins;Gate. Romance isn't the motivating factor, the main male character isn't as two dimensional as the others, it had a good ending. The problem came when the plot unfolded, and I correctly predicted several "twists" without knowing the plot in advance. It is like playing the New Super Mario Bros Games. Formulaic. Predictable. Diminished experience. So that is why I feel Steins;Gate isn't the megaton series most say it is. Again, it is very good, and I encourage anyone to check it out. I'm just saying because of my nature, the experience was ruined for me. I was hoping for more original setups and advances in plot. That is my honest opinion, and please remember it is just an opinion. A few other things bothered me about this series as well, but that was the main contributor to my disillusionment of the series. Keep an open mind, and form your own thoughts. That is today's lesson. Now on to The World God Only Knows. Going from series that was supposed to be original to one that makes fun of series based off of dating sims. I'm in the perfect mood for that.